Soft, soft, soft. That’s how I’d describe Papillon Perfumery Dryad. When I was a kid, we used to pull cattails from the creek bed and twist their velvety tops open, releasing clouds of “fairies” into the breeze. 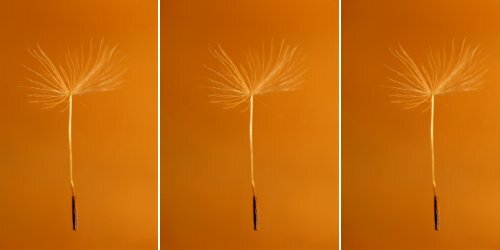 Smelling Dryad is like chasing these seeds as they float in a meadow. It’s all about texture. Papillon’s founder Liz Moores created Dryad, and its notes include narcissus, oakmoss, jonquil, costus, galbanum, clary sage, deer tongue, cedrat, benzoin, lavender, thyme and orris. When Moores describes Dryad, she talks about the aroma of the forest surrounding her home and mentions that Dryad will smell familiar to lovers of Miss Dior and vintage Vol de Nuit. I understand the references to these fragrances in Dryad’s green, hay-infused, leathery and mossy scent. I’d add Nina Ricci Fille d’Eve to the list, too. But the one thing Dryad has that the other perfumes don’t is a texture as light as goose down. Dryad’s opening is a rich combination of galbanum (tart, smashed flower stems, leaves and cut grass) and narcissus with its hint of ashtray that gives the note the innocent-dirty feel I love. Moss and herbs take over as the galbanum retreats, and iris seasons Dryad’s heart rather than playing a starring role, given it a bare hint of sweetness. After twenty minutes or so, the “baby scalp” scent of costus comes through. It's sophisticated but easy. Dryad settles into a sage-tinted leathery-mossy phase for a while before spending its last several hours humming in a quiet herbal-resin halo. I can dab it from my sample vial before my morning coffee and still smell it after dinner. While it’s present, it’s never intrusive. When I wear it, it’s sort of the “salt” to bring out my day’s style rather than driving force behind how I appear to the world, if that makes any sense. I can’t imagine Dryad making any headway on department store shelves. It’s too subtle and elegantly old-fashioned. If you’re looking for a fragrance with Papillon Salome’s in-your-face attitude, you won’t find it here. Yes, Dryad does have Miss Dior’s clary sage and galbanum and leather, but it doesn’t show any of the perfume’s freakiness. As for the comparison to Vol de Nuit, the two fragrances share narcissus, galbanum and an easygoing character, but Vol de Nuit Extrait is sweeter and thicker. To me, what sets Dryad apart is its chiffon-like weight on skin. It gives the fragrance a hard-to-pin-down presence that glows in the background, letting you — not your perfume — be the focus of interest. I could imagine someone choosing Dryad as a daily fragrance, then punching it up with Miss Dior, Piguet Bandit, Carven Ma Griffe or Christian Dior Dioressence when he or she wanted to make a statement. I’m already shortlisting this one for my Best of 2017 list. 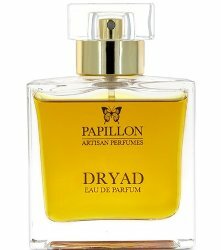 Papillon Perfumery Dryad Eau de Parfum is $160 for 50 ml. I got my sample at Fumerie, but for a full list of stores carrying the line, see “Stockists” on Papillon’s website. Note: top image is Delicate Fall [cropped & tripled] by frankieleon at flickr; some rights reserved. Ethereal but dashing, this along Naja have been my happy discoveries this year so far. Beauty through a halo. Sounds exquisite. I enjoyed Salmoe but found Absolue pour le Soir my favorite in the “what animal is under the couch?” genre. I love green scents, from thick and sappy to light and airy. This is going on my list. “What animal is under the couch” is hysterical! I like the green, too, but it was the narcissus that really grabbed me in Dryad. Thanks so much for reviewing this one, Angela! I just heard about it yesterday, and it immediately went to the top of my to-try list. Galbanum, iris, narcissus, and oak moss? My idea of heaven! And if it reminds you of soft little wafting cattail fluffs, so much the better! I have so far been able to resist the Papillon offerings as being “not my style,” but this one really sounds like it might be. I generally don’t care much for clary sage — I caught a whiff of it in Thomas Jefferson’s garden at Monticello once, and nearly got whiplash from jerking my head back, eww — but galbanum and narcissus seem to be my biggest weaknesses. Lovely review, Angela, and I’m going to put this one on my wishlist now. To me, Vol de Nuit is significantly different in EdT and Extrait. That said, it’s an easygoing, background sort of comfort fragrance to me. I’d love to know what you think of the Dryad, if you try it. How do you feel about Miss Dior’s clary sage? I love Vol de Nuit! But I’m perfectly fine if not everyone does. Same! I have a vintage Vol de Nuit parfum sample that was on sale at Surrender to Chance a while back. It smells like a musty closet to me. I keep trying to “get” it and might have to accept that I never will. (Love the vintage bottles though). Okay, if I’m truthful, there really is a bit of musty closet with cardboard to Vol de Nuit in Extrait. But I like it! And there’s more, too, of course. I bought a VdN EdT bottle from frangrance net and it is verrry different from the parfum, even sort of modern parfum. It’s unctious, spicy like a cookie, and very very smooth. The EdT is brisk and subtle and needs ten sprays. I agree–the EdT has more of a kick to it. Agreed, a dreamy review. I have never tried any Papillon fragrances but your review has set me on the trail. Merci toujours. It’s worth a sniff if you stumble across a tester! Have you tried it yet? Be sure to sample! Angela, just ordered a sample at Luckyscent. I’ll report back. Thanks for a great review. Thanks for this lovely review, Angela! This sounds like a must-try. I thought Salome was interesting but I prefer something more subtle, and this might be just the ticket! I was also just reading your most recent newsletter, which is one of my favorites. And that Xtabay dress! I always enjoy them. I’d love to know what you think of it, and I’m glad you enjoyed the newsletter! (Anyone who wants to sign up can go to my website angelamsanders.com, by the way.) Dryad is much more subtle than Salome. I tried Dryad yesterday and it was really good – tempted to a bottle. Agree that it’s airier than Vol de Nuit. I found the costus-narcissus axis quite animalic in the early stages but mainly when I was sniffing my wrist point-blank – it was lovely in the air. Yesterday was hot, too, which no doubt amped that side of it. I love galbanum and there was plenty there too. Gah, you’re killing me here. I do think you’d like it! Thank you for dropping in to report! Your description sounds right in line with my experience. Wearing it again today in the cool and finding it much less animalic but a lot smokier – very interesting scent. Also (maybe the sage?) there’s a slight hint of plasticine on me – not nearly as much as with Dior Granville though. That had a very odd effect. I wonder if the sage has to do with its smokiness, too? Plus, I definitely detect a leathery feel–perhaps a little bit of what you smell. As you say, it’s interesting! D8mmit Angela I was doing my best to ignore this one despite it ticking a lot of my boxes…… but your reference to Fille d’Eve (the costus aspect?) has undone me. Happily I will be able to sample it and if it’s love well then I have promised myself a bottle of perfume to “celebrate” my redundancy when that happens (likely next month). Fille d’Eve is such a strange and wonderful little creature! You’re being laid off? Yikes! My fingers are crossed that it all works out well for you. One of my best life changes came when I was laid off. Thanks Angela! I am hoping to follow your example then. Can I also just say to UK readers that Papillon perfumery operate a decent sample (2ml) service – all 5 (ie inc Dryad) for £18 plus £3 shipping. Sample programs can be so nice. I know lots of people who discovered Ormonde Jayne that way, too. Ooh this sounds tempting, thanks! You make it sound soooo good, especially to a lover of Vol de Nuit Thank you for the elegant review! I really liked this one. It’s less sweet and velvety than Vol de Nuit perfume (no Guerlinade!) but lighter and greener. I tried it last weekend only on my arm. It is gorgeous but upclose I smelled something almost medicinal that stopped it from being an instant love. Dont know what note caused it. But today I am wearing it to work (2 small sprays in neck and one on my wrist), and i dont get medicinal anymore. When you really wear it and not picking apart notes, you get this green/warm aura. Its a contender for my ‘daily wear wardrobe’, soft and office friendly but it keeps my interest and it shifts into a very cosy skin scent. Thank you for dropping by to leave your impressions! I bet it was the sage that felt a bit medicinal. Yet the sage gives it character, too. I’m glad it feels cozy. I really like all Liz Moores perfumes and she does an excellent sample service. I tried Dryad last week and it really is a shape shifter and just reading all the previous reviews will make mine seem a bit odd. On my skin it’s like walking in a very green pine forest, it’s subtle and lovely and then I get a leather note that’s just like Bandit. It’s that slightly meaty oily leather that Bandit is famous for but much more toned down. After that it’s a mix of herbs with a predominance of Clary Sage. If Salome is about Cumin then Dryad is all about Clary Sage. It’s lovely but I prefer Salome. It lasts a long time and shifts between very green foresty tones to Clary Sage with a hint of leather. Lovely but not for me. Thanks for leaving a mini review! I love hearing about how fragrance interacts with different people’s skin and how they feel about it. You’re description of “walking in a very green pine forest” sounds so alluring to me right now.